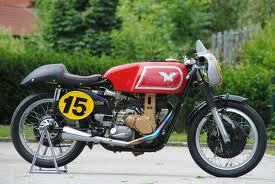 “At Cookstown I raced my Aermacchi 350cc and my Seeley G50 500cc. In my race with the Aermacchi I had to wait until race 10, which didn’t start until 4pm. I got off to a good start but quickly got ‘mugged’ by some faster Hondas. However I settled into the race and by the third lap was in 3rd place, just 2 seconds behind the leader. Unfortunately the bike then had an electrical failure so I had to retire. Next was my turn to race the G50 and in this event there were bikes up to 1000cc, twice the size of my engine so I was dubious about my chances. At the start I got away in 4th place then moved up to 3rd place, behind John Scott on a Triumph and the leader, Rob McCrum, on his Weslake. On the last lap I felt I could overtake John but decided to be cautious and settled for 3rd place. I then had the nice surprise of being awarded 1st place in the 500cc category, which more than made up for the disappointment of the Aermacchi breaking down in my first event. Thanks for the update Allan. I wish you all the best in the 2013 racing calendar. Nigel.